Christie has expanded its reach to Port Fourchon, a major seaport on the Louisiana coast. Port Fourchon has recently completed construction of a new multi-agency Emergency Operations Center (EOC), including a 30-seat incident command room utilizing the Christie Phoenix open content management system to display all of its integrated security systems in one visual operating space as the centerpiece of its emergency response activities. With Christie Phoenix displaying the port’s Maritime Domain Awareness System during real or simulated training incidents, Port Fourchon personnel, industry clients, and emergency management officials can now collaborate and share information, as well as view a common operating stream for greater situational awareness and enhanced incident response and decision making capabilities. Additional Phoenix nodes can be added to address the expanding technology requirements of the port, which is currently in the next phase of expansion that will more than double the port's size to meet the needs of the growing industry it serves. Port Fourchon is located on the southern tip of Lafourche Parish, Louisiana, on the Gulf of Mexico. It services over 90 percent of the domestic deep-water oil and gas exploration, drilling and production activities in the Gulf of Mexico. Comprised of seaport and airport services, it also leases land and facilities to tenants in the oil and gas industry. 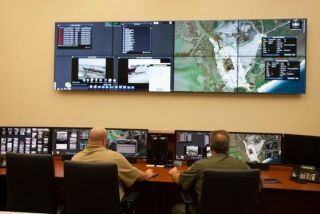 Its EOC features technologies that include a 4 x 2 video display and two 70-inch annotation displays in separate breakout rooms, with the EOC utilizing Christie Phoenix to display the port’s maritime domain awareness system GLPC-C4 (Greater Lafourche Port Commission Command, Control, Communication and Collaboration), surveillance cameras, a radar solution, an Automatic Identification System (AIS), and other associated technologies. According to Port Fourchon, the key concerns during the design of the EOC was to provide a physical space where key personnel and officials could collaboratively and securely view all of the streams of data available through GLPC-C4 system in order to view incidents, collaborate, share in information and make decisions -all in real time. Christie Phoenix proved to be up to the challenge of meeting those concerns. Among its functions, the Phoenix can take data on the video wall and throw it onto one of the annotation displays, allowing the Coast Guard to break out and discuss a certain situation and devise a plan to present to a larger group. The Phoenix can also move programs around the screen with ease, having particular items pop up within seconds and simultaneously display multiple applications at-a-glance, without the need to go in and out of applications or for closing and reopening streams. Danos noted that, in an emergency, the incident command center must be able to quickly connect with industry and government stakeholders, including the U.S. Coast Guard, Department of Homeland Security, Louisiana Governor’s Office of Homeland Security and Emergency Preparedness, as well as local governments, such as the Lafourche Parish Government and Lafourche Parish Sheriff’s Office to allow for swift reaction times and collaborative decision making. The command center is also utilized for training purposes in the use of camera systems, software applications and large scale security drills. All of these functions have been made more convenient and accessible with the installation of Christie Phoenix. “Any technology that can help us react as swiftly as possible and collaborate easily is essential to our operation,” she said.